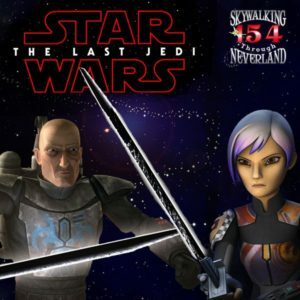 On the newest episode of Skywalking Through Neverland, I had the opportunity to discuss the darksaber, Sabine Wren, and Mandalorians, especially following on the heels of the latest Star Wars Rebels episode, “Trials of the Darksaber”. Our discussion is from 42:07 until 1:11:22. For those less familiar with the darksaber, I have written about its appearance in Star Wars: The Clone Wars, Darth Maul regaining possession of it, its first appearance in Star Wars Rebels, and, most recently, the origins of the darksaber. There is more to write about the darksaber, even just in “Trials of the Darksaber”, not to mention future episodes of Star Wars Rebels…. It was also interesting to look into the matter of Mandalorian clans and houses for the show, which I might, at some later point, turn into a post. But, despite some confusion – just what’s been shown to us on-screen – about houses and clans, it seems that Sabine Wren isn’t Clan Vizsla, but, rather, House Vizsla. Also in our conversation we speculated about what might happen with Sabine and more. One caveat about this appearance is that I had my ten-month old son along with me, which was not only the first time, but probably also the last time, since he ended up being somewhat of a distraction not only for me, but also the hosts of the podcast. Thus, I noticed that I spoke more filler words (“um”, “eh”, etc.) than I typically say on the podcast. In any event, if you’re curious to hear about the darksaber, Sabine Wren, and Mandalorians, then give it a listen!